Video, display, mobile, tablet & native ad intelligence for the world's top advertisers, agencies, publishers and ad tech providers. "Pathmatics as a digital source of truth"
We like the accuracy of reporting compared to Nielsen Digital. The visibility into social is variable. We also wish this had other channels in the digital environment, such as digital radio. 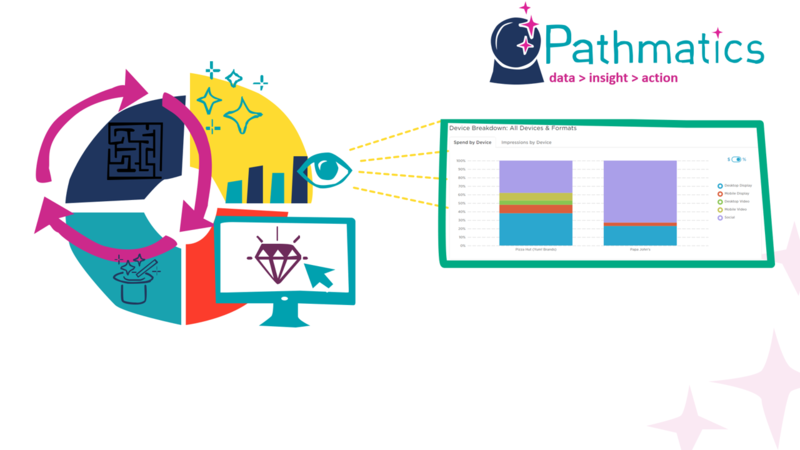 Compare Pathmatics results to your current spend to validate the data. Compare against Kantar Digital and observe the improvement in accuracy. "Pathmatics is great for media"
I like that you can export data to excel and also view the creative. I like that you can also see all the different creative that is running. It was really awesome when social was added to the reporting as this is something our clients rely on heavily. The detailed list of website by spend and impressions is helpful for us as a media agency to determine where our competitors are and where we can go. Sometimes brands are grouped together in a way that makes it difficult to dissect the date. When I've reached out to the support team to have it broken out, they are not able to do it although larger brands do get broken. In the future, this is something that can be turned into a product benefit. It is a good product to use for accurate competitive digital reporting and competitive analysis. The support team is quick to respond. The reporting mechanisms are easy to use and the creative is updated frequently. I use Pathmatics for competitive analysis. It gives a more detailed overview of actual spend and impressions. The support people are very good at communicating with special requests. When using Pathmatics, you can easily toggle between client spends and see the creative all in one place. It is a useful tool for New Business and Marketing Science alike. I think that you can market to New Business clients more than just day to day users, because it is one of the rare tools that has so much information all in one easy to use dashboard. I honestly do not dislike a thing about the tool. It is easy to use, easy to teach, and easy to review. It is organized in a clear and concise manner. I think that the cost is fair, but that is only because I do not have to pay for it out of pocket, and my company pays for it. Again, I would use the tool for more things than just looking up competitive spend. It is useful when pursuing new clients for a company because it easily shows online spend in a variety of ways. Additionally, it shows creative in the same place, which is hard to come by. I work on the New Business as well as day to day client servicing, and I think it is a great tool for New Business. You can easily see the spend of a client that is more accurate than any other tool in the industry. I think if you targeted New business teams to use the tool, you would get even more subscribers. "Easy and Quick Competitive Tool"
Pathmatics is a very quick tool to use. It easily allows you to view competitors ads, spend and sites purchased in order to quickly understand the digital landscape of competitors. There are several different tools available to compare spend among competitors. Additionally, you are easily able to download the charts the Pathmatics creates and drop them quickly in presentations. I wish that we were able to look at the spend of competitors based on region, because this would be helpful for some regionally focused clients. Additionally, I wish that there was a section where you could create your own customized downloadable reports, in order to pull a report that we can easily download in to excel to put it in our own view. I know that you are able to download excels, its just not as easy to customize the columns. Pathmatics is a great tool for tracking competitors digital activity in a simple and easy to view format. If you are looking for a tool to track the digital landscape, i recommend Pathmatics. Pathmatics has easily allowed us to quickly check the competitive landscape in order to understand what is new. You are easily able to filter by date in order to quickly see the most recent new units competitors have released and also understand what new sites competitors are spending money against. This easily helps us understand if competitors have new partnerships we need to be aware of. "A simple overview of competitive spend with small details"
The ability to see top spenders of a property and also top properties that an advertiser invests into. I also like that we are able to see which devices the assets are for, and what percentage of their spend goes into which device, such as mobile, desktop display, and desktop video. Some video creatives are only downloadable in formats that aren't able to be exported into a Powerpoint deck. Also, there is no option to look at spend per creative asset on a monthly, daily, or weekly level, which makes it difficult for us to determine spikes in spend. This makes it difficult relay back to other insight teams to figure out why and where a campaign is performing the way it did, and the way it affects the competitive space/industry, and the way it affects sales and consumer. It's a good, informative tool for having an overview of many different competitors in many industries. You can also drill down to products, although some nuanced products that are not as popular are not yet available. Either that, or they have no digital advertising spend for that product. Looking at competitive brands and how/where they are investing for Digital. It's also a very good look at their top creative assets. Also, because we can see how much of their share of voice goes into mobile vs. desktop, we can see the growing popularity of mobile spend, if there is a growing popularity in some months. We can also see potential white spaces where there are less competitors and opportunities for us to dominate a location on either devices where we will face less traffic and more competitive costs. "User friendly, instant download, best tool for competitive analysis"
The interface is very user friendly and reports are almost always downloaded instantly. It also added Social (and Native!) into the channel mix recently, which is great as our client invest pretty heavily in both channels. I like it that Social and Native are now available on Pathmatics, but it would be even better if more channels can be included - more specifically, offline channels if possible (e.g. TV, OOH, etc.). I also noticed that when you pull brands individually, you get more information than pulling multiple in "Advertiser Comparison". It would be great if we can get the same information at the same granularity when pulling multiple brands. Last time, I ended up pulling 7 brands individually - Hoping this can be fixed soon in the near future. We pull SOV data for our competitive analysis. It clearly lays out the media spend across digital, social and native channels. Benefits: This tool is very user friendly and downloads are almost always instant. It also allows for pulling multiple brands at the time, making it very easy to compare our client with its competitors. I like the feature of saving comparison so you can retrieve it later for further edits. The option to export results in Excel Infographic and PPT is also amazing. Its super easy to download creative screenshots - we get this request a lot and find this tool super helpful. "Great Tool to add to your Competitive Arsenal"
The numbers don't always seem to be the most accurate, more of a directional tool than an actual spend and advertising. It also seems that it struggles to pick up programmatic advertising spending, which over the past few years has become extremely vital to the industry as a whole. The tool helps us understand what other Advertisers are using in the digital space and how their creative differs from product to product. It has been helpful for all agencies because of this, for media digital spend is a great insight and from a creative perspective being able to see what taglines/CTAs can help inform what we do in our creative messaging. I love how nice the UX is, basically anything you want to do is accessible! I also like how easy it is to dig deep into direct sites as well as the programmatic spend. The video creative feature is really helpful as you are able to quickly download and see pre-roll ads. It's also nice how far back it goes in terms of collectible data. The way you can click into the charts to gain additional information that's broken out easily is also great. I wish that it was easier to access social data and use it as easily as display. It's also hard to capture the infographics sometimes, as the screenshots are so large and detailed. It would be nice if it could export into a few slides easily. There isn't a lot to dislike about this program based on what's available out in the world. It's tough to capture the full landscape, but this is a great start. This is a great product and very sophisticated based on what else is available out here. Competitive analysis, and creative reviewing. We also use it as a way to figure out digital strategies of new business and competitors of those brands. It's very nice to also see the device breakout for particular brands and the sub-brands as well. We're also able to see a more accurate representation of digital vs. using our traditional competitive analysis tools. I like the platform and the simplicity, easiness to navigate. I like being able to breakout between each device. Having images of the creative is also really helpful. Additionally, example of the top sites is a nice to have as well. As this is directional, it is hard to tell how accurate the information is ( I don't think this is specifically Pathmatics though). It would be nice if there was a way to see if there is a new creative without clicking each creative and looking at the dates. We use this for competitive conquesting. It has helped us to understand what other people are doing in the market place and how it will affect our buys. It gives us insight into the competitors and what we could do differently or help us understand what we are already doing that is unique. "Great for competitive insights and new business development "
Ability to quickly get a read on what a brand or publisher is doing from a media standpoint. This is often my first touch point to gain a sense of how monetization and partners are distributed. Targeting tactics (from the buy side) can influence the accuracy of the platform. For example RT or heavy use of DMP since these audience profiles skew spend and how it can be read by the tech. Great for new business opportunities, allows you a view behind the scenes of what a brand is doing with buying, what environments they are serving on, what tech is in place. Allows us to be much more proactive with recommendations. We also leverage the platform to provide our client with competitive insight - we pull together the reports and add our interpretation of the risks and opportunities present in the market. "Lots of Data Available, No Major Complaints"
I most like the amount of data available, I have never been limited by the date range or by not finding the company that I was searching for. While there are a few things that could likely have a slightly better user experience (such as when searching on a particular brand within a company rather than the "All Brands" default), there isn't anything that I actually dislike about Pathmatics. Our clients have all been impressed with the amount and the variety of data that we have been able to provide them with the help of Pathmatics. As Pathmatics continues to improve existing platforms and expand into new ones it seems likely that the variety and quality of data will only continue to improve. I use Pathmatics to conduct competitor analyses on a quarterly basis and to help in writing new business proposals. I like being able to compare the different brands I am looking for information on to one another as well as time periods that go way back. Within the dashboard you can see the impression spike of your advertiser and can understand better consumer insights based off the details that you put in you get out. I don't like that all of the details are not totally up to date and in real time. Would be great to see more details and information on creative within the platform. I am currently solving creative comparison, brand comparison, as well as understanding the marketplace. by using Pathmatics we have been able to develop a better business model for our clients. "Pathmatics drives our competitive conquesting and alerts us to future threats." I like that I'm able to gather real-time competitive data with an easy user interface. It gives us a quick look into new creative and new competitive priorities. The ability to review competitive creative, see the pages the message is driving to is crucial information. I'm not able to export the data by week (only see Daily, Monthly, Quarterly). It's also hard to measure more custom digital sponsorships. You have the ability to plug in competitors and capture real time data that can be manipulated and exported in many different ways. We're able to measure the effectiveness of our digital placements by analyzing share of voice in our placements and in the segment. This has helped us inform where there is white space and places with less "noise" to heavy up. "Good tool to review competition"
wish it was more interactive and had more options to cut the data. wish the PPT download was editable. its hard to combine data sets when downloaded to excel. "Very good and reliable "
Ability to sort between device type , 1 sense of asset , and digital vehicle . Internet site lists and buying methodology is great too. Plus, SOCIAL delivery and estimated spend- that is a big win. Visuals that we can directly export is great, all the options (raw data, visuals, etc.) are at our fingertip . The UI is very easy to navigate and any feedback is addressed as soon as possible. I don't like how you can't break out product spend within a brands total spend more easily. I have to look through the actual images of the advertisement to find what I am looking for and it would be Nice to have the ability to select a brand and then select the different merchandise they advertise as a secondary alternative . Ability to go deep on competitive buying strategy as well as our own buying process. We've used Pathmatics to understand our picture to unsafe website that we've blocked, etc. "Great tool for what my team needs." Through Pathmatics my team is able to track our competitors digital spend and placements. The ability to see top creatives and where they are placed is vital to our planning efforts. We also use Pathmatics to evaluate our own brands and be able to back into reported spend and actual spend to caveat to our clients. My only dislikes on Pathmatics are that you cannot separate out by product for digital spend and that no social spend is tracked. For the product separation, an example is when we want to look at Hefty paper plate spend but the spend for trash bags is also included. Great tool, easy for entry level planners to use and be pros on quickly. Use the export tool to pivot the data into a client facing document. We are solving our SOV in the spend aspect. We use these learnings to recommend high investments in certain tactics to challenge our competitors. We have realized we sit in the middle of high and low spend for our category. "Great competitive insights.. it's like you get to spy on your competition!" I love being able to see where my competitors are advertising, and to see an approximation of what they're spending, what devices they're targeting, and the creatives they're using. I would love to be able to see more social data beyond just Facebook. This is a pretty expensive tool, especially considering that there isn't a month-to-month option. Our sales person allowed us to do a smaller 3 month engagement so we could try it out before agreeing to a full year contract. This was much easier for our finance team to agree to than a full year's contract. This has been great for us to be able to dive into our competitors' activity and to see where it could benefit our clients to start advertising. We use the data to visualize share of voice and to identify the right mix of advertising spend, based on what the competitors are currently doing. "Great resource, but still some gaps..."
If you take the time and effort to actually go through the ad call paths there is a wealth of information to be gathered. It is also extremely useful to have the media buy details and the creative accessible in the same place. We use the exported charts in our presentations all the time and our clients love how clear they are. There are still a lot of gaps in what is actually reported. Spend and Impression level data is significantly underreported. It would also be a huge help to not only see site direct partners and sites the brand shows up on, but to show what DSPs and trade desks they use as well. It is so easy to use - a very intuitive tool. The data is as helpful as you make it. There are a lot of different features that you can use to gather information. Sometimes you need to do some data mining yourself to really get it to show what you need it to, but most of it is there. I would caveat that it is still under reported, just not as significantly as other tools I have experience with. We are trying to identify what endemic sites our competitors are buying direct vs. what they are able to buy programmatically. Pathmatics allows us to track those relationships in real time. The balance of display & online video is also a question that we are asked to explore for our own brands from a revenue driving perspective - but qualitatively we need to be able to answer to how our competitors are utilizing their assets as well. "Easiest platform with the most information"
The platform is so intuitive, i rarely have a moment of confusion. All data is streamlined and categorized effective where you will seldom wonder where a specific tool is. Highly recommend! This tool also has the most up to date data where most tools in similar fashion will require a digest time of at least 2 weeks. It would be great to be able to dive deeper into brand categories. For example while searching for Ozark under the Netflix brand, it would be great if could separate by creative so get more granular. Its hard for me to separate the FYC ads from the Season 2 ads. If the categories could be "season specific" that would be incredibly helpful. That said, it's almost impossible for a system to determine the difference between the ads, so we understand! To be sure that you are looking at the most granular level of data. This tool allows you to go very deep and get very specific which is the best way to get the best results. We're able to use an easy to operate tool to gain competitive information on brands in the same industry in seconds. for example, if we has a competitor of Netflix need to investigate into media tactics and spend levels for a specific show, we are able to really get a deep dive into what media they ran, the pictures of such media, as well as the spend levels for each. We especially enjoy the links to the live ads to see how they lived at the time digitally. I we Just wish that this was across other media channels such as TV or OOH. "Very good at collecting top-level digital research"
That Youtube data isn't included as a majority of our clients have YT buys and have a lot of video content -- this restricts us in the information we are able to supply as it becomes limited then. Also, it doesn't include social data which also restricts the "Digital" information we are able to supply. "Good but still room to grow"
It is very easy to use, just a few clicks to get the data needed. The creatives are high quality and include full length videos. Lack of availability of product-level data (e.x. within a brand, being able to break out digital spends by product line). They are sometimes available for larger brands but never represent the full scope of the brands lines of business like with what I used to see from Kantar. The lack of accuracy of the spends data as well brings up a lot of questions from clients and makes it difficult to use the data. I like the visuals Pathmatics provides, they're simple yet they tell a great story and I've shared them in client presentations multiple times, as they're easy for anyone to understand. Sometimes it seems spend/impressions are a bit misleading, and knowing Pathmatics and AdIntel Digital are the same source, it's frustrating to see discrepancies between the two. Use the new social data, it's very helpful across all brands to leverage this data. It's beneficial to present this data to clients, show macro trends, and then form recommendations based off of the competitive landscape. I anticipate with the recent addition of social insights this benefit will continue to prove useful. "I really like Mathematics and always recommend it to co-workeds over other tools we have in-house. " I like the interface. It is very user friendly. A training is always beneficial but I think anyone can work their way around it. I also like that you all take and implement feedback. I like that you can see the actual creatives that ran and go to the site they ran on. I used to dislike one of the exported reports. It would show me total budget for a timeframe instead of monthly budgets but I think you all fixed that. It is way more accurate than other tools that report out digital activity. We use it mostly for competitive info and new business knowledge. "Pathmatics is good for a quick pull and to get a competitive glance, but not for deep insight"
I like that creative is included, and its easy to use. The charts are a good way to show the information for quick hits. i like that you can filter by time period also easily. Quick pulls on competitive information, ideas on other sites to use that maybe we weren't thinking of. I like the ability to see where my clients are spending and the detail of how that is distributed. It's good to see who we are up against, when there is activity, and if we're losing out to other partners or other market variables. Like many services similar, the accuracy is questionable. Looking at where it has the spend of my company for my clients, I can tell it is not completely accurate, although it gives decent detail. Being able to solve who we are going up against, what times of year clients are spending, and what types of media that they like to buy. Very user friendly tool for competitive searching. Pathmatics has up-to-date information covering a multitude of sub-brands under portfolio names. Your information will be easily transferred in any way you want to present it! I love how it provides all necessary downloadables for use- exporting function as Excel, PowerPoint, Jpg and Mp4 formats. And pleasing to the eye- Interface has a good use of white space, colors, very organized into categories. Clients love to see examples of competitive data. They want to know more than just what creative is running, but also how many impressions they deliver, CTRs, view time, most popular websites and type pf buys, to guide their own direction for digital ads. Pathmatics is the best solution for giving them the most actionable information. The fast load times for data requests make it easier to run reports. In addition to the ease of running reports, because of the speed, we are able to more efficiently gather larger groups of data. We are able to save time and deliver more comprehensive studies. Yes, I have recommended that other teams also engage with Pathmatics for research. Those that have used it, agree that it's interface is much more user friendly than our previous research products. "Much more accurate digital competitive reporting"
- I like the idea of the breakdown between how advertisers are buying the media (direct to publisher, DSP, etc. ), but have found through looking up my own brands that this is largely inaccurate. "Great start but still needs improvement"
Data is updated in real time. Graphical user interface is nice and easy to use. I haven't found a way to pull competitive brand spend by month+by site. When I exported by month, it includes ALL sites, so I had to pull each month separately and find the one site in the sites tab I needed, then stitch together. Showing where competitors are and are not spending to either compete for find untapped audiences. "Great information for helping clients." Sometimes the data isn't always correct but does have a good idea of what is happened which is mainly around programmatic. "Quick insights to show competitors paid creative"
The best thing for me is being able to quickly access paid ads that were run during a specific time and download them quickly for presentations. The only problem I have had is with the media spend, for Amazon research I was doing there was a glitch where no matter what time frame I picked it had the exact same amount. The main problem I am solving is being able to justify how expensive a certain campaign would be comparing it to a similar strategy. "Pathmatics serves as our main digital reporting and creative tool"
I like the advertiser comparison feature. This really helps inform initial insights when we dive into a new brief. Viewing the creatives is very helpful in understanding the landscape and adds more color to our knowledge. Would be super useful to have some sort of audience insight into the placement of ads. Though its understanding this might not be possible. We are informing ourselves on potential and current clients. The benefits include an accurate picture of how brands communicate on the difference devices and properties. "Excellent Digital Competitive Analysis "
I really like the detailed site spending and ease of use. The ability to parse direct vs programmatic spends allows us to analyze advertising trends for our clients' competitors as well as look at spending trends for prospective clients. in this sense it is a great tool for existing and new business. Pathmatics is an excellent tool for campaign planning and identifying competitive digital advertising trends. Additionally it is a great resource for new business. As stated above I am primarily using this for competitive analysis for client campaign planning. However we are also using this for new business prospecting so that we have an understanding of where they advertise. The fact that it shows all the creatives and gives an insight to everything in a friendly manner. Goes into showing the different type of media channels and actual spend to channels. Go more into detail about what it can do and measure in terms of way more specific and everything towards that. Seeing the types of the campaign competitors are going with and especially in digital realm. "Have not come across a better tool to measure digital ad spend"
Pathmatics is a VERY easy tool to navigate and within just a couple clicks I'm able to compare digital ad spend among several brands. LOVE how simple it is to do this and how it's an exportable function. Additionally, being able to manipulate the dashboard by device, as also been extremely helpful. I wish Pathmatics had the ability to measure spend on other platforms (TV, print). Although our focus is in digital, this functionality would allow us to uncover even more opportunity. Pathmatics allows us to evaluate how and where our advertisers are spending. It allows are sales team to be fully aware of the current landscape and make suggestions to their clients that align with it. "Pathmatics is one stop platform to Know your Competitors digital spends"
"Pathmatics is Great for gaining deeper competitive insight"
This is a great visual tool that helps understand the different channels an advertiser uses as well as a window into the different types of creative they are using. We are understanding what our competitors are doing in the digital space a bit more granularily than what we see from Kantar. Pathmatics is a great tool to quickly pull and view information. "Best Application for Visual Competitive Research"
I love how easy it is to build custom competitive site lists to compare with our own on a weekly basis and the ability to simply download visual reporting for sharing easily. I dislike the lack of contact information for reaching prospective clients. I am mostly using Pathmatics to provide competitive analysis to our larger sales org. I have realized the benefits of their visual reporting customized to directly compare with our own campaigns..
"Reliable and usable digital media data in the marketplace"
Ability to sort between device types, assets, and digital vehicles. Website lists and buying methodology is great too. Plus, SOCIAL delivery and estimated spend- that is a big win. Visuals that we can directly export is great, all the options (raw data, visuals, etc.) are at our fingertips. The UI is very easy to navigate and any feedback is addressed as soon as possible. Limited list of Creative IDs can be exported in a given report. Depending on the number of creatives for a given time period, the period needs to be reduced, and duplicate Creative IDs would need to be removed, requiring extra steps in the data clean up process. Spend by brand variant/sub-brand for competitors to better understand the sites they're running on, assets they have, and how often they rotate them. Whether there is activity in general so that our brands can allocate more support to our brands/subbrands. Also linking the creative to their corresponding landing pages. That's very helpful in seeing if they're partnering with specific retailers, and how often. "Pathmatics up to date competitve data is great for presenations and directional reports "
I have had very few issues. However, one I've experienced is a reporting crash when using an old advertiser comparison. We use this data for directional reports and use insights from the tool for presentations. "Quick and Easy Competitive Analysis"
Pathmatics is very user friendly and visual. It's easy to navigate and pull data quickly and in an organized way. Not all brands are available or categorized in an way that makes sense. Sometimes it takes a bit of time to sift through and pull what you need. Additionally, the Social data is limited and is a bit more manual. For example, you have to click on each Facebook ad to be able to see what product is featured, what the copy is, etc. Pathmatics helps me run quick competitive analyses for my brands. It centralizes digital activity and organizes in a way that is useful for these types of analyses. "An expensive but superior competitive product!" The competitive creative UI is super easy to navigate as well as the spend and site comparisons. Also being able to compare different clients with each other in a single chart is really useful. Love being able to export to different formats as well. Not being able to easily set up a dashboard that populates every time I open the program with the competitive info that I care about. I don't care about what TD and P&G are spending. I would also LOVE the ability to see social and search in here, but I know, I know... walled garden. The biggest barrier to usage for most people is the cost. I understand your competition is priced much lower, but that the tool is relatively unhelpful and doesn't cover everything you do, but it is limiting if you are at an agency that doesn't have the $ to subscribe. I am able to gauge what the public perceives about our spend level vs what we can see about the competition as well as the similarities and differences between our buys and those of our competitors. This highlights areas of opportunity and also saturation for media recommendations that are very useful to clients. I like that it accurately measures digital ad spend so you can more easily see what competitors are doing in the marketplace. I don't like how you can't break out product spend within a brands total spend more easily. I have to look through the actual images of the ads to find what I am looking for and it would be nice to have the ability to select a brand and then select the different products they advertise as a secondary option. Where we measure up with ad spend within the industry. Also, what are key time periods and networks our competitors focus on. "Very useful tool for platform-specific spend insights"
Being able to narrow down spend by native to specifically look at active players in this space. Its also great being able to see latest creative. Sometimes we find out that the data isn't accurate e.g. it suggests an advertiser is only using one partner when in fact we find out from them directly that they are also using exchanges. Targeting new brands to approach as well as understanding how existing brands are using us in their media mix. Its also great for meeting prep as you can quickly build a picture of a brands activity, targeting, creative messaging etc with one simple search. "Pathmatics is the best for competitive info"
I was frustrated yesterday because the date range wouldnt stick for my pull. It would be great if this were to be somethign that I could easily change and make sure that the report is pulling through within the right date range. "Fast, efficient, and really visually friendly way to gauge how an advertiser is doing"
"Easy to use, always available and a great source for digital competitive." The amount of information available is very helpful to understanding competitive strategy. Many filters make it easy to find what you're looking for. Lack of formats tracked. While this is the case for all competitive activity; it is hard to understand the full digital landscape when so many formats/channels are missing. Great for a quick pull, when looking into specific advertisers or when developing a category view across many brands. Ability to go deep on competitive buying strategy as well as our own buying process. We've used Pathmatics to understand our exposure to unsafe sites that we've blocked, etc. Its easy to export data externally to excel. It is also integrated with the social media platforms. I liked using its detailed lists of sites by impressions and spend which are good for checking the competitors' position in the market. I have a problem with the grouping together of brands since it impedes dissecting of the date. It boosts subscriptions of clients. Makes daily client servicing easy and effective. Its great for analyzing the competition in the market. Tracking of the clients' spending in different sites is easy. "Pathmatics is simple and effective"
Easy to use interface, and it gives multiple ways to display the data including ppt. Love the creative feature allowing you to easily assess competitor creatives. It's easy to use. I like that it shows us the creative pictures as well as what site it was on. I do not like the compare feature. It could be more organized. We are using Pathmatics to see what other competitors are doing with their campaigns. It helps us notify the client what the trend is for our industry. The ease of navigation, and ability to quickly sort the data, search by date, industry, location. What could be improved is the # of available businesses listed for Canada, western canada specifically. This is a fantastic tool for lead generation! Being able to show clients what their competitors are doing in terms of display advertising and spending is so valuable. * We monitor all Pathmatics reviews to prevent fraudulent reviews and keep review quality high. We do not post reviews by company employees or direct competitors. Validated reviews require the user to submit a screenshot of the product containing their user ID, in order to verify a user is an actual user of the product. Hi there! Are you looking to implement a solution like Pathmatics?